An address by Dr. E. C. Shaw for 24th September, 1973, at the unveiling of a plaque in Bonnycastle Park, Winnipeg. Exactly 235 years ago, Pierre Gauthier Sieur de Varennes et de La Verendrye arrived at the Forks on the Red Riverthe 24th of September, 1738. It is therefore fitting that we honour him today. La Verendrye’s statue on the east side of Manitoba’s Legislative Buildings. He was born on the 17th of November, 1685, at Trois Rivieres, (Three Rivers). He was the son of Rene Gaultier, a veteran of the French Army who had settled in New France and was the Governor of Trois Rivieres. The title Sieur de Varennes et de LaVerendrye came from properties owned by the Gaultiers. Pierre joined the colonial army as a cadet at the age of 12 years in 1697. Four years later, at 16 years of age, he was commissioned. He participated in attacks on the British colonies in Connecticut (1704) and in Newfoundland (1705) . In 1707, when he was 22 years old, he sailed to France to fight for his King, Louis XIV. France was fighting an alliance of European countries, including Britain. At the battle of Malplaquet, LaVerendrye was wounded nine times. He was mentioned in the Orders of the Day and was made an infantry lieutenant. However, that did him little good. He was captured and spent 15 months as a prisoner of war. He was released in 1711. Due to a reduction of the French Army, he lost his hard-won commission. Through the intervention of Madame de Vaudreuil (wife of the Governor General), he was again commissioned in the army of New France as an ensign (sub-lieutenant). He returned to the colony in 1712 with little to show for his efforts but his battle scars. In that year, at the age of 27, he married Marie Dandonneau. To augment his poor farm income. LaVerendrye began to trade in furs. In 1727, at the age of 42, he was made assistant Commandant of les Postes du Nord, the Northern Posts, with headquarters at Kaministikwa at Thunder Bay. These posts were on the edge of the “terre inconnu,” the unknown country. The west and route to the western sea now beckoned. 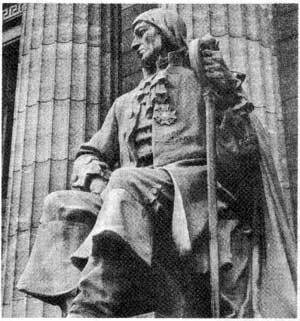 In 1729, LaVerendrye became first commandant of the Posts of the West. Two years later, LaVerendrye had entered into an agreement with business men of Montreal and had received the sanction of the crown to explore the western lands and to trade there. Fort Paskoyac on the Saskatchewan, 1741. In 1744, La Verendrye retired as Commandant of the Western Posts. He was forty thousand livres in debt. The next five years were unhappy ones. However, his fortunes changed in 1749. He was awarded the Cross of the Military order of St. Louis and given a captaincy in the Marines. 1749 saw his reappointment to command the western posts. He was not to see them. He died in that year at the age of 64 years. Fort Dauphin at Lake Winnipegosis in 1952. Provincially, LaVerendrye’s name has been remembered in that of a school, a park and statues, one of which, appropriately, is located on the east side of the legislative buildings. His exploits are also commemorated at the Quebec legislative buildings and at Trois Rivieres, his birthplace. Belief in God, Integrity of action, Fearlessness in the face of the unknown, Gentleness of spirit.